In Open Space, work populates the wall and the floor. 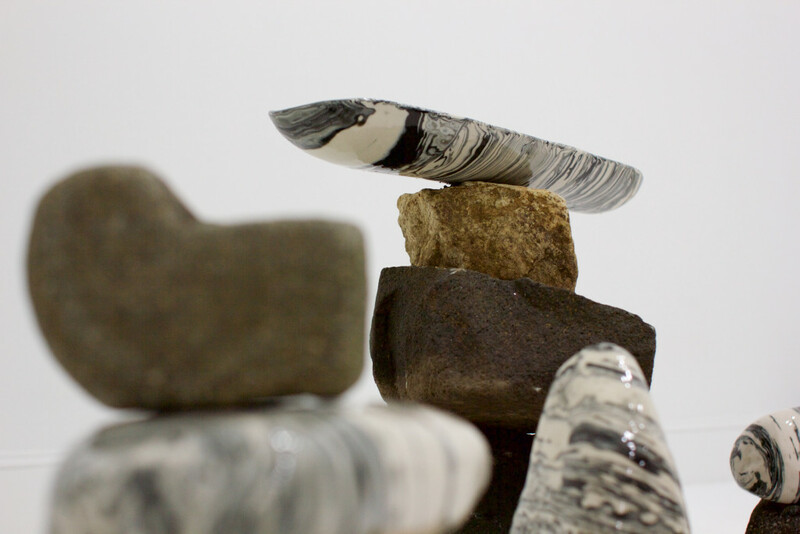 Lucia Maher-Tatar and Christina Haines use language of simplistic measure in the recent show Half Past, Two Rocks Back, denoting time through the physical and, in this case, the rudimentary and sometimes the rudimentary domestic. Lucia Maher-Tatar’s piece A Rook, A Rock, A Crooked Café is hung on the wall from a rod. It talks like a curtain, but acts more like a tapestry. A conspicuous but complex composition creates a space where time is imprinted into symbolic anecdotes, spilled out, nonlinear and landscape-like. What lay obstructive were moments where the craftsmanship felt filled in, such as a shimmery swatch of black hastily stitched rather than carefully placed, leaving disjunction from the beautiful and the strange— little waves puckering in a brown rectangle, like they would delicately make the sound of a mouth rising out of the water. A ladle made of links/a scythe? Stitches to the left, some careful, some not. Leaving some strips vacant, for rear access, or for economy. Grommets large and in numbers, that allow dedicated access to the inside of the piece. 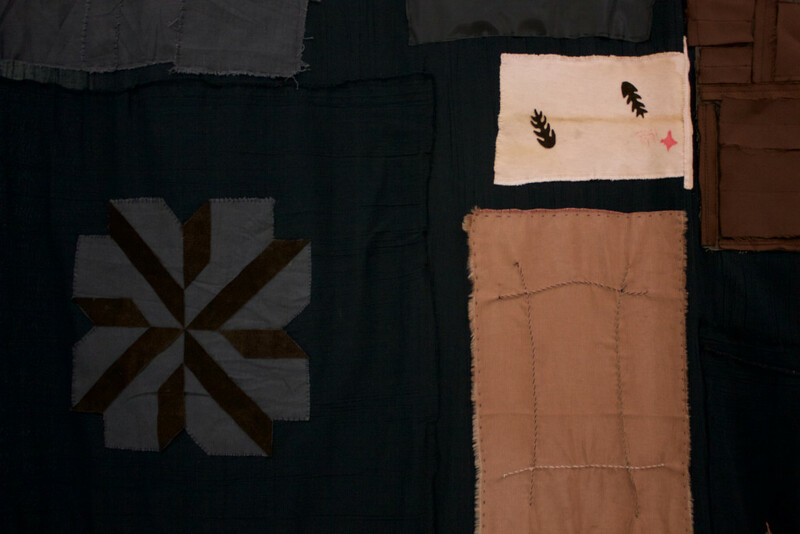 The cutting, stitching, and displaying of personal symbols allows the artist’s mind to come through their hand. The work combines the liminal as object and as function. 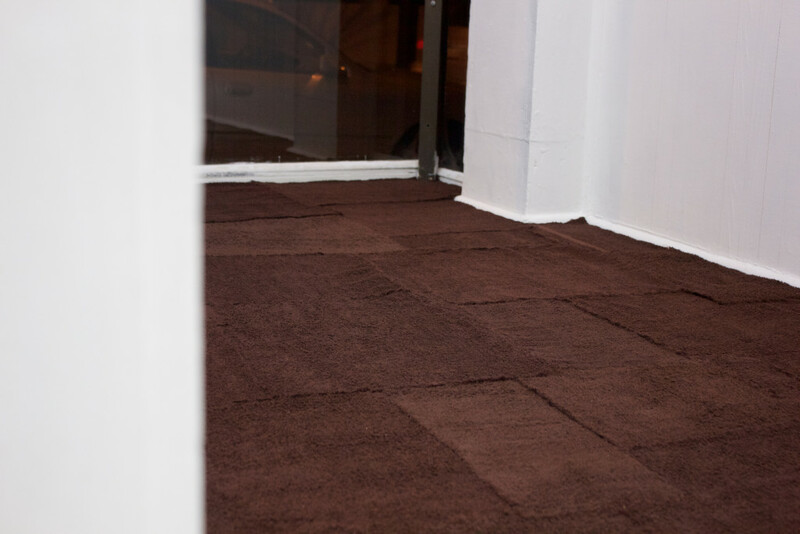 The same could be said about the other Maher-Tatar piece, Untitled, involving brown patchwork terrycloth on the floor of the windowed display areas. Christina Haines’ work includes six rectangular pieces on the wall all titled Burnout 1 through Burnout 6 and a glazed ceramic and rock assemblage titled A Tree. A Rock. A Cloud. The Burnout pieces have a luring quality; for me, it could be an attraction to the texture of destruction. 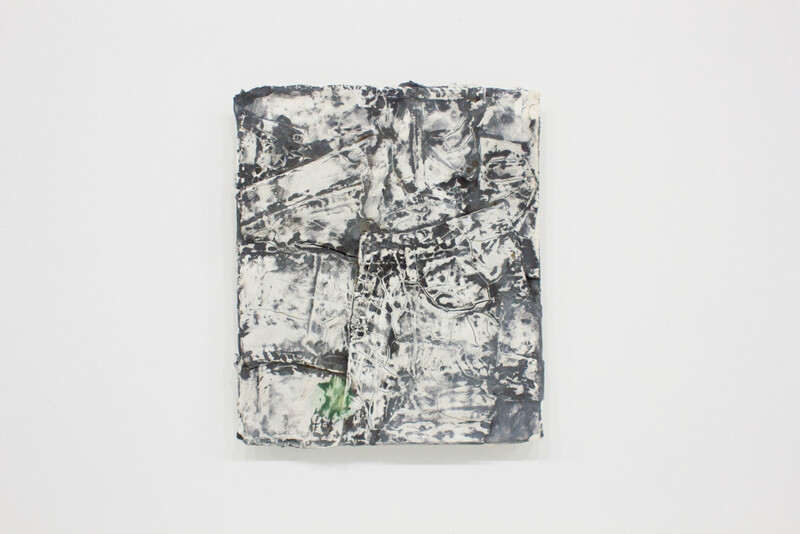 These pieces are cracking and reveal sediment, washed over and dried, showing the waistline of a pair of jeans or sweatpants—starting and stopping at the edges of the rectangle, as if I were looking at a thumbnail of a body, buried in the river. Belt loop is a bridge. A cracked, then peeled opening (the only one) leads to an underbelly. Some pieces have little green dots. A man has a small green tattoo behind his right ear. The pieces themselves have goose bumps. I found them almost too laconic. The nature of the material blocked off into rectangular shapes was very tidy. Without matching directness in the imagery, they almost meander into dullness. In the piece A Tree. A Rock. A Cloud., the ceramics look like polished stones, perfect objects, revealing layers from formation but with sensually smooth and unassailing surfaces. These ceramics felt texturally uncomfortable stacked, sandwiched between their pre-manicured cousins, as if they might scratch. I have to remind myself I am talking about ceramics and not actual polished stone. 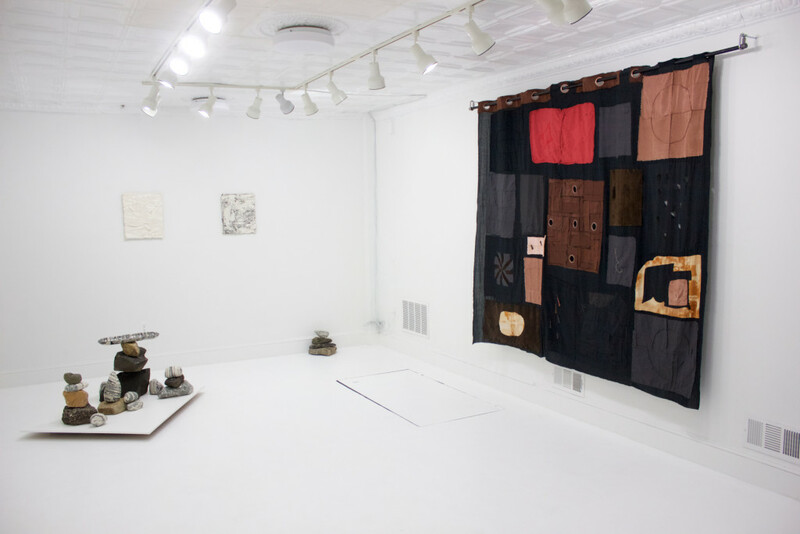 The artists as a coupling: Haines let the material speak unhindered, and Maher-Tatar intrudes on the fabric’s material quality, neither insincere, and both intelligent observers of their respective material. A friend says, “I keep looking for the rest of the stuff.” and I must agree. There is a craving for more to grasp onto. And I think it has less to do with “stuff” and more to do with striking the senses of the viewer. Give me something to grab, or put me in your place. The style is LARPing, conspicuously mimetic, though there should be a push towards an embedding, which I know they are capable of. My hope is for them to wield their sensibility with a stronger conviction. Half Past, Two Rocks Back is open on Saturdays through March 26, 2016 at 512 W. Franklin Street, Baltimore, MD 21201.